Take a taxi from BTS to Suan Luang National Park. 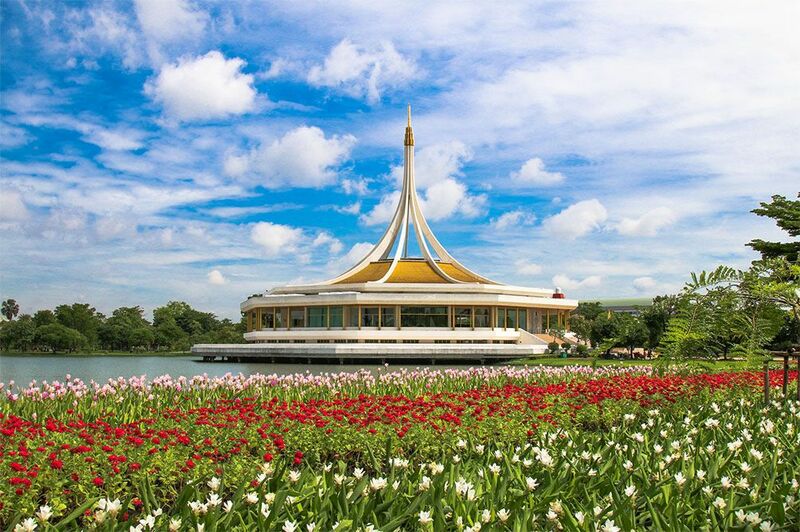 Wander around the Suang Luang park and ride on a boat. Take a mini bus to the night market and let's chill out, go shopping, taste street food and drink beer at a bar. Wander around the Suan Laung Park where most locals hang out with a family or friends, picnic and work out. Enjoy sightseeing at many beautiful flowers in the garden and see sunset. You also can sit around the canal to feed fish or ride on a boat. Take a mini bus to the market. Then, walk from the Srinakharin night market where you can see street food and product sold at hawker stalls, restaurant and bars along the path toward the market. Learn about Thai street food at hawker stalls, restaurants and bars inside the market. Also take a chance to see classic and old cars at the car museum and on the footpaths of the market and take selfies. Taste 4 street foods and 1 drink at the market. Have fun on shopping experience at the market. Have 1 drink of cold draft beer at a local bar and enjoy listening to English and Thai songs played by a local band. Take a taxi to BTS or to go back to your hotel.